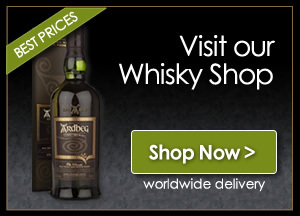 This is one Nicola and I here at Whisky Boys HQ have been looking forward to tasting. After ceasing production in 2015 and very sadly missed, The GlenDronach Revival Aged 15 years now returns to the core range of the distillery’s line-up. The expression embodies The GlenDronach’s signature style of Spanish Sherry Cask maturation in fine Pedro Ximénez and Oloroso sherry casks from Andalucía, quietly sleeping for 15 years in the darkness of their dunnage warehouses. 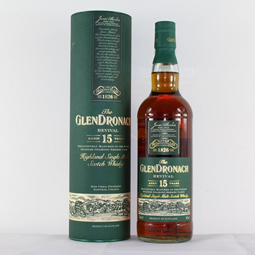 The GlenDronach Distillery nestled in the valley of Forgue, deep in the East Highland hills near Aberdeenshire, is named after the source of its water: the Dronac burn. Founded in 1826. It was also great to meet Stewart Buchanan a couple of weeks ago, the Brand Ambassador for GlenDronach and BenRiach at a tasting of the new BenRiach 12 Year Old in Edinburgh. Nose… The nose has plenty of goodness, sticky toffee pudding, prunes and dates and salted chocolate. Taste… Opulent and sweet, spiced apple, dried orange peel. Black Forest Gateau cake, sherry soaked dates, luxurious dark chocolate mousse. Finish… Long finish, headed up by chocolate and cherries leading onto chocolate, quite divine. That was outstanding the lady (Rachel Barrie) has done it again, an absolutely outstanding sherried dram. Well done all at GlenDronach another stonker.